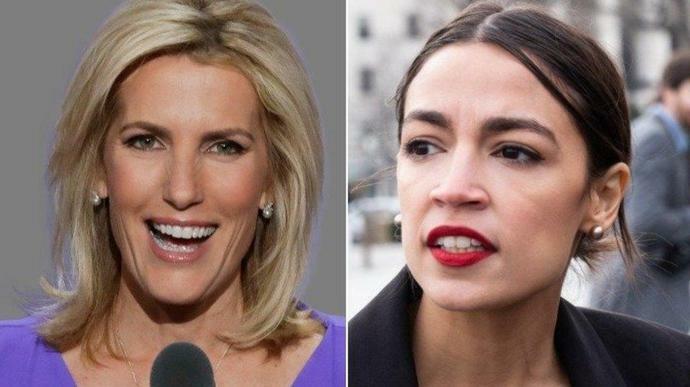 Fox News host Laura Ingraham ranted about "minority privilege" as she attacked Rep. Alexandria Ocasio-Cortez (D-N.Y.) for criticizing her on Twitter. Ocasio-Cortez wrote last week that Fox News had "crossed a line beyond conservatism and into outright bigotry" with its financing of Ingraham and fellow host Tucker Carlson. Ingraham in response railed against what she described as the "continuing effort to beat everything into the ground as a racist offense" in Thursday's episode of "The Laura Ingraham Show Podcast." "So, when you can't debate a point, you throw back 'white privilege, you can't understand,' and then there's nowhere for that person to go. You shut down debate," she said, and added: "Alexandria Ocasio-Cortez is trying that little trick on Tucker Carlson and me." Ingraham urged Ocasio-Cortez not to judge her, and then asked about "the privilege of being a protected member of a class that you can never criticize, lest you be called racist?" "That's privilege," Ingraham added in audio shared online by Media Matters. "I think Victor Davis Hanson called it 'minority privilege' in his piece that he just wrote, that the people who are the most protected are the people who are the first to say 'white privilege' because then, you can't ever criticize them again." How Does Alexandria Minerals Corporation (CVE:AZX) Affect Your Portfolio Volatility?